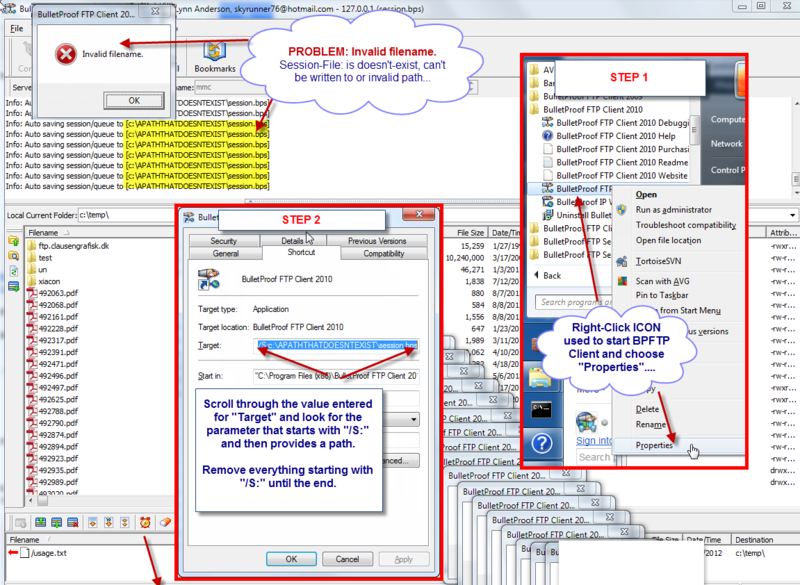 In BulletProof FTP Client, it’s possible to define a Session File for the software to continuously save the current ftp-server and the files that are queued for transfer. By default, the software performs this action and uses the Windows Temporary-Directory for the storage of the session-file. You may choose your own directory for these files, by using the below command-line parameter. This will cause the software to use the given file for the storage of the session-file. Fixing this is easy and involves either creating the directories again where the file exists, fixing the permissions for the directory or file in the OS, or changing/removing the command-line parameter and let BPFTP Client use the Windows Temporary-Directory. The second illustrates Right-Clicking the icon used to start the software and selecting Properties.